We have been informed by the Central Bureau for Astronomical Telegrams (IAU 5946 and Nova Necwork) that R. R. Treffers, A. V. Filippenko, and S. O. Van Dyke (University of California at Berkeley) and M. W. Richmond (Princeton University) reported the discovery of a supernova in NGC 4526 (R.A. 12h 31m 31s Dec. +07° 58.5', epoch 1950), located 9" west and north of the galaxy nucleus. "The object was found on March 7 UT (R = 15.2 magn.) during the Leuschner Observatory Supernova Search, which uses an automated 0.76-m telescope equipped with the Lawrence Berkeley Laboratory CCO camera. Confirmation was made with an image taken through thin fog on March 9, and the object appeared to be brighter than on March 7. It could not be detected to a limiting magnitude of R = ~17 on March 1. Inspection of spectra...reveals that the supernova is of Type Ia, probably about 1 week prior to maximum brightness...The continuum is very blue. This supernova could reach magnitude 11 to 12, since the parent galaxy is in the Virgo Cluster." 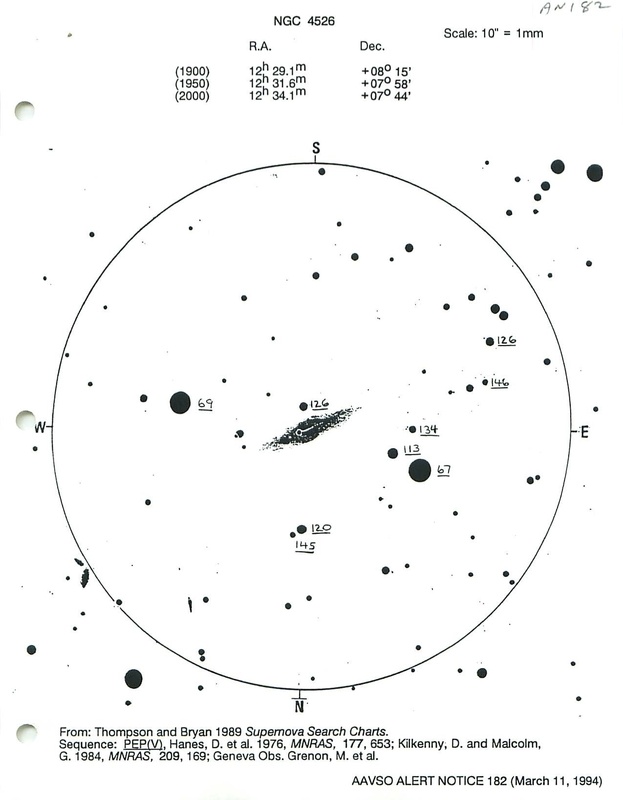 Accompanying is a finder chart for this galaxy and the surrounding field from the Thompson and Bryan Supernova Search Charts (1989). The comparison star magnitudes are all photoelectric (V) magnitudes and are from Hanes et al. 1976, Month. Not. Royal Astron. Soc., 177, 653; Kilkenny and Malcolm 1984, MNRAS 209, 169; and Geneva Observatory, Grenon M. et al. 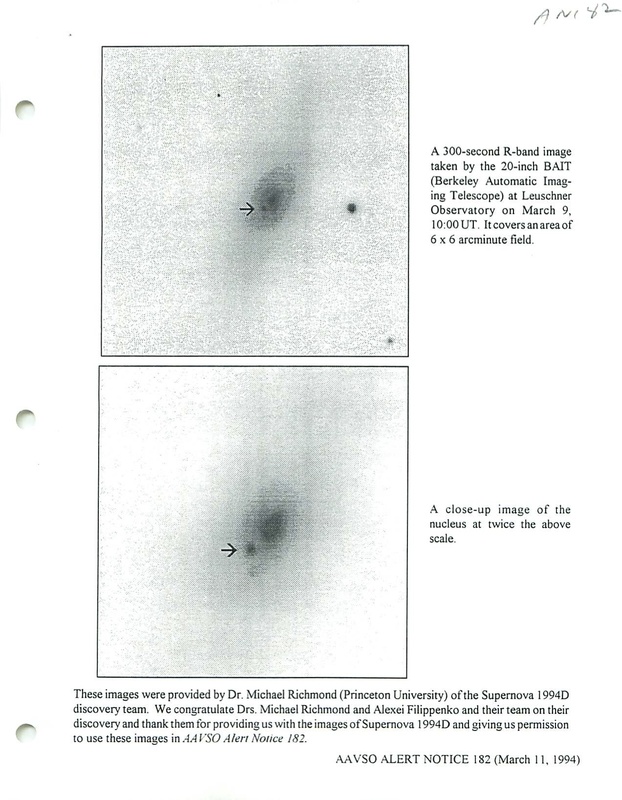 Also accompanying are CCD images of NGC 4526 showing the supernova, provided by M. W. Richmond and A. V. Filippenko. Below are observations reported the AAVSO and the Central Bureau of Astronomical Telegrams: Mar 9.90 UT, 13.5 (J.-C. Merlin, Le Creusot, France; photovisual); 9.901, 13.7 (B. H. Granslo, Sollihoegda, Norway); 9.932, 13.3 (H. Dahle, Oslo, Norway); 10.885, 12.9 (0. Midtskogen, Tranby, Norway); 10.961, l2.5 (G. M. Hurst, Basingstoke, England); 11.548, 12.8 (Y. Sekino, Kanagawa, Japan). Please monitor the supernova closely and report your observations, giving the exact time to the minute, to AAVSO Headquarters using our charge-free number (1-800-642-3883). Be sure to indicate the comparison stars you have used in making your estimates. Mar 2.0 UT, 8.2 (D. Overbeek, Edenvale, S. Africa); 4.49, 8.6 (W. Dillon, Missouri City, TX); 5.0, 8.5 (Overbeek); 5.20, 8.6 (M. Zanotta, Laino, Italy); 5.54, 9.4 (P. Collins, Scottsdale, AZ); 6.42, 9.8 (P. Walker, Middlebury, VT); 7.0, 9.0 (Overbeek); 7.0, 9.2 (J. Smit, Waverley, S. Africa); 8.48, 10.9: (R. King, Duluth, MN); 9.48, 11.0 (King); 10.46, 10.9: (Dillon); 11.1, 11.0 (Smit); 11.013, 10.8 (Overbeek); 11.065, 10.8 (Overbeek). R. M. Wagner, Lowell Observatory, reports that the spectrum of this object taken on Mar. 4 by R. Bertram does not look like a nova spectrum. The continuuum is very red, with a ''very narrow H·beta emission line" and many narrow absorption lines. He comments that this object may not be a nova but a long period variable (Nova Network). This is certainly a very interesting object that deserves very close monitoring! Please monitor it whenever possible and report your observations to HQ.